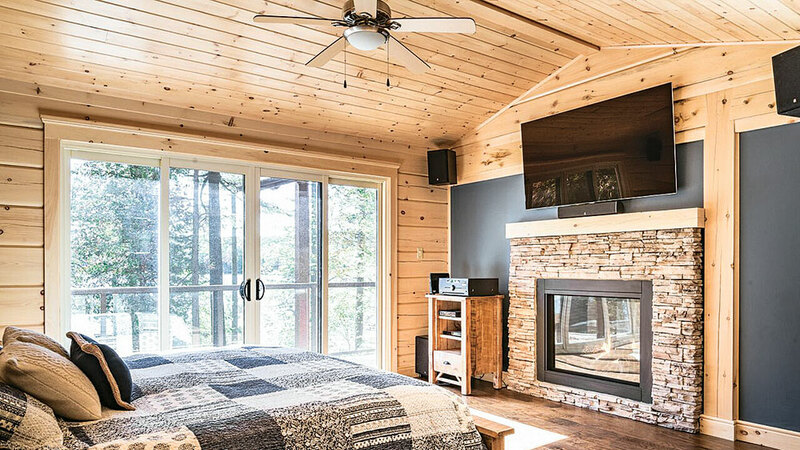 Preserving decades of memories in an existing cottage — as well as making new ones — was a top priority for this log and timber home’s growing family. It’s never easy when you realize you’ve outgrown your home. You have to decide if it’s time to move or, even more difficult, tear down and rebuild. Years of family memories and milestones are held within these hallowed walls. Such was the case with the owners of Cricket Creek, located along 12 Mile Lake in Ontario, Canada. 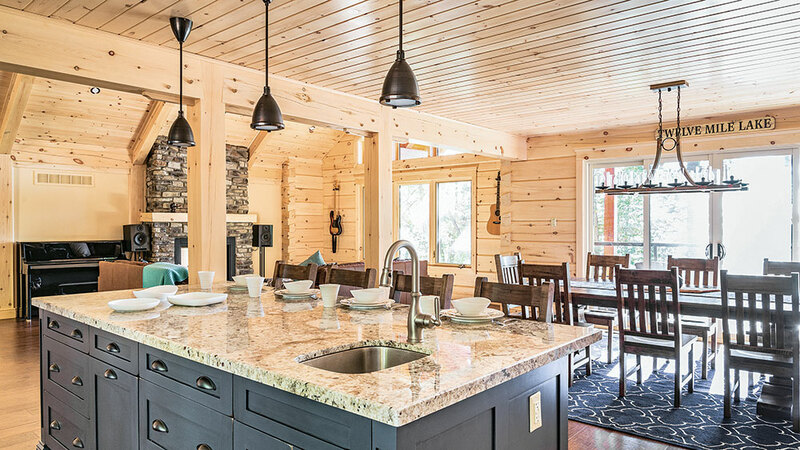 They had an existing cottage on their lakefront property, but it was old, needed a fair bit of work and the layout couldn’t accommodate their growing clan. 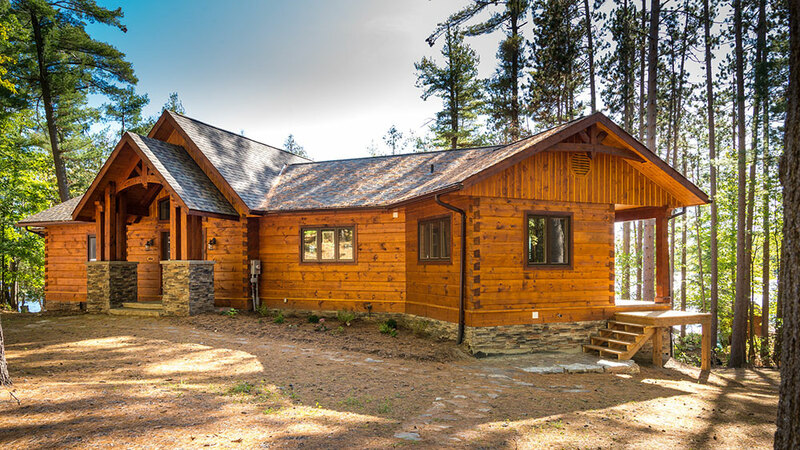 When they decided that the best course of action was to completely rebuild rather than renovate, they were pleasantly surprised that they were able to salvage much of the existing cottage and convert it into a guest cabin on the property. It was the best of both worlds. 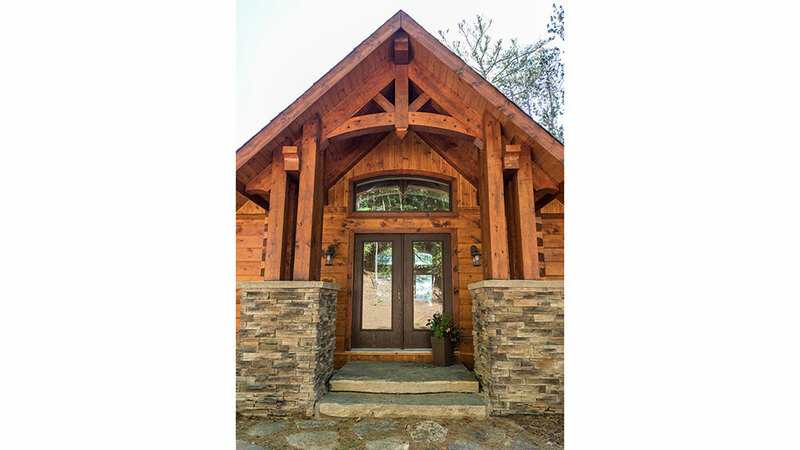 The new 3,512-square-foot hybrid-style home morphs log and timber frame construction together. 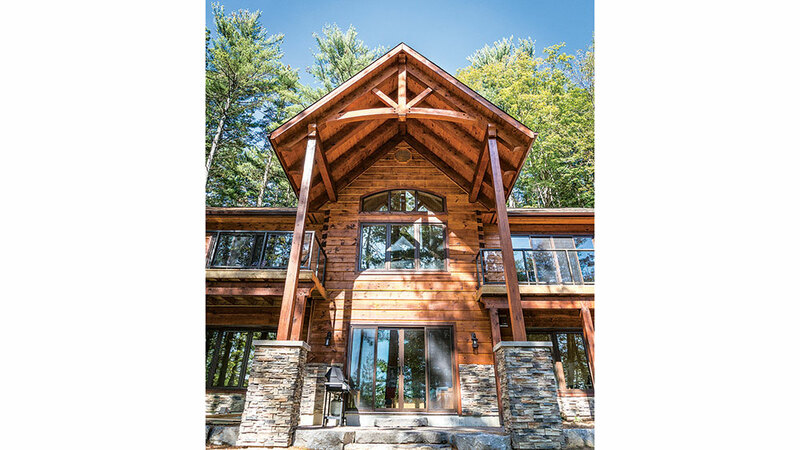 Dramatic timber trusses in the entry, great room and off the rear covered porch on the waterside, as well as a full timber-framed sunroom, lend a dose of drama to the homey feeling imparted by the full-log walls. The northern white pine logs are square 6-by-12-diameter with dovetail corners. No chinking is required, thanks to Confederation’s double-tongue-and-groove interlocking system, adhered by three lines of sealant (though chinking can be added for aesthetic purposes). 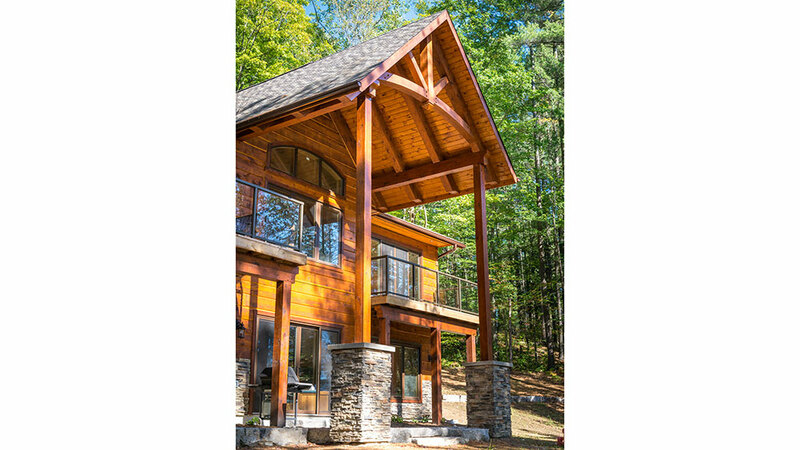 The rough-sawn finish on the exterior face not only gives the wood texture and dimension, it takes the stain better, according to Rich. 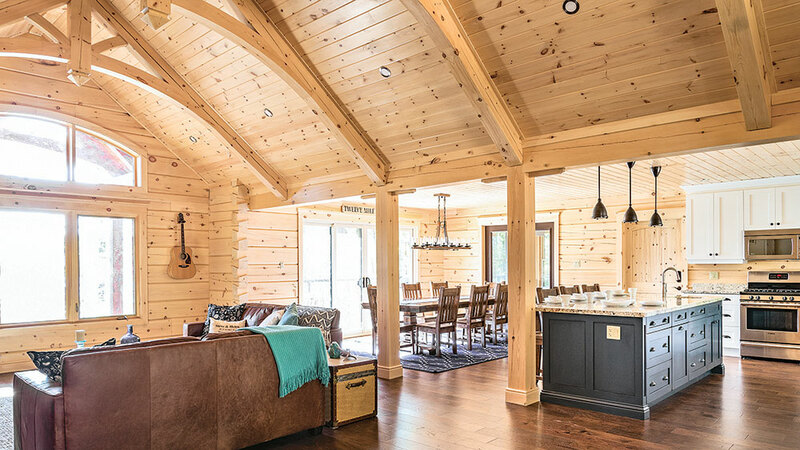 To keep the house as bright as possible, the interior log walls are coated in a clear, natural stain, as opposed to the darker tones used outside. 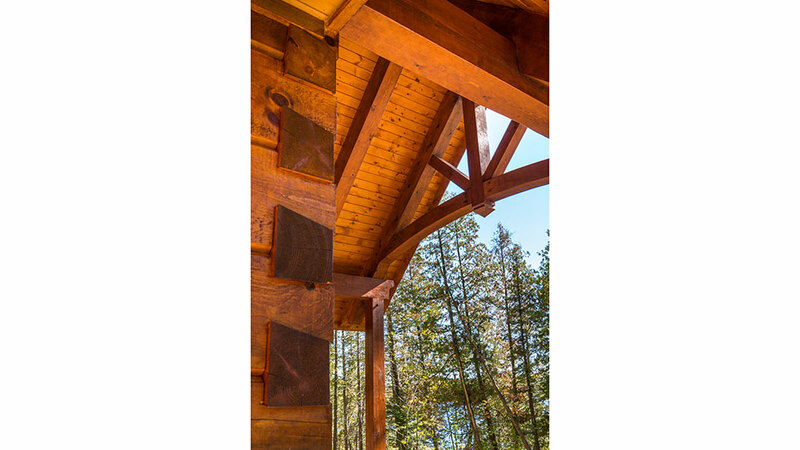 Unlike a structurally timber-framed home, the king-post trusses employed inside this house are purely decorative. The arched collar-tie adds a little extra flair to the design. The home’s layout was purposely planned so that when people want to be together, they have the utmost ability to do that, but when they want to be separate, they have ample amounts of privacy. The main level’s design serves a dual purpose. As the family’s primary residence, the wide-open plan keeps it from feeling congested when everyone is there, but it’s also highly functional for entertaining. “Whether you have two people or 20 in the great room, it’s comfortable. You feel like you’re in separate rooms, but everyone is still a part of the action,” Rich says. As they planned and built this house, the owners were wisely looking down the road at retirement, so a main-floor master bedroom was a must. The basement level contains the overnight overflow, with three bedrooms perfectly suited for guests and grandkids alike. So now, the family not only has their cherished history to hold on to, they can look forward to many years of new memories and the legacy to come. 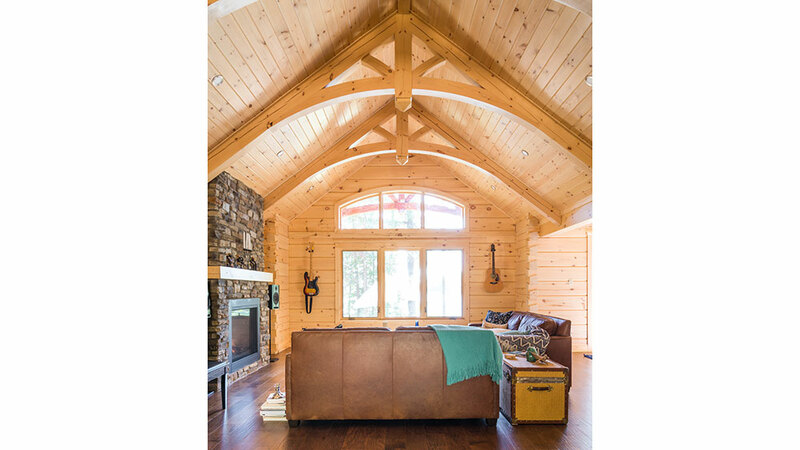 In contrast to the rich, cinnamon shade of stain selected for the home’s exterior, the interior white pine logs are clear coated, showcasing the wood’s knots and grain and keeping the rooms bright.